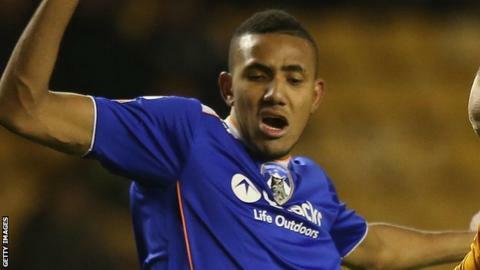 Cristian Montano, the winger sacked by Oldham following allegations of spot-fixing, is to sue the club. However, the National Crime Agency (NCA) has since released all six from bail - although it says the investigation is ongoing. The player is now to seek damages, BBC Sport has learned. His solicitor, Roy Ledgister, said: "At the time of his arrest we urged Oldham to suspend him and then reach a conclusion at the end of a trial. They did not do this, acted recklessly and on emotions and will now have to face the consequences." He was implicated in a Sun on Sunday story which claimed he had tried to get booked in exchange for money during a clash with Wolves at Molineux. Despite no criminal charges being brought, the League One club made the decision to sack Montano, saying the move was made on disciplinary grounds and was irrespective of legal proceedings. Mazher Mahmood, the undercover journalist behind the story - also known as the Fake Sheikh - was later found to allegedly entrap victims to create crimes, according to a BBC investigation. Following the collapse of a case against former X-Factor judge Tulisa Contostavlos, around 30 convictions secured thanks to evidence from Mahmood are currently being reviewed by the Crown Prosecution Service. Montano, speaking from Colombia, said: "At the time I felt like my life had ended. Nobody would listen to me. My agent turned his back on me and we were thrown out of the club when I went in with my PFA representative. I always said that there was more to this than met the eye. I wanted to give my version of events but nobody would listen." Oldham chairman Simon Corney, speaking from New York, told BBC Sport: "We find this development very surprising given that the National Crime Agency's investigation into Cristian is ongoing. "However, should this go to court then we look forward to making public the various issues with Cristian that led to our decision to terminate his contract."